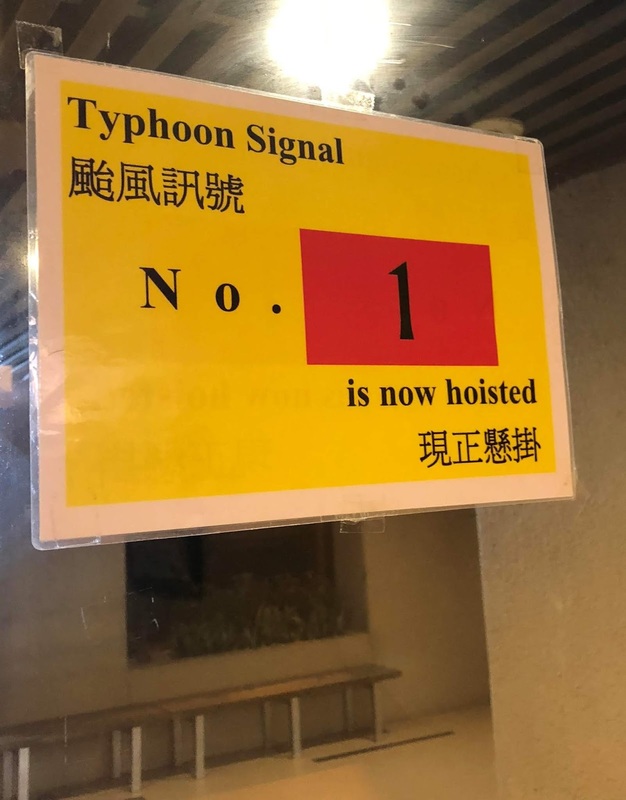 My Wandering Life: Typhoon Season is here! 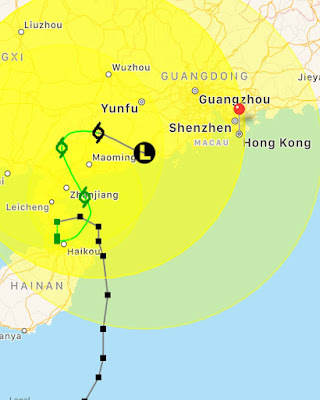 So here we are, officially in Typhoon Season 2018 for Hong Kong! Granted, a T1 is nothing to be worked up over (it's kind of a standby signal), but less than a year ago when we had just moved into this flat, we got a T8 and a T10 (the highest rating) in the same week. Our home on the 16th floor flooded (windows don't like rain that blows horizontally for hours on end) repeatedly while my husband was on a business trip in America. It was frightening in a way this girl who grew up in earthquake-prone California has never been frightened! When I see the yellow sign with a number, any number, boxed in red, that week of very wet, scary hell comes rushing back to my mind and I just want to curl in a ball somewhere very dry and cool without any wind or shaking buildings. The current storm heading our way is expected to slow down and fade away rather than intensify, so we're good for now. But don't you love the way the storm kind of did a little twirl there? Maybe it was doing the Hokey Pokey and it turned itself about... The name of this storm is Ewiniar, which sounds like it would be right at home in a JRR Tolkien novel. It actually comes from the name of a storm god from the island state of Chuuk in Micronesia. While the storms in America go in alphabetical order and swap from traditionally boy to girl names, the storms in Asia go in alphabetical order of the countries who submitted them, and they aren't even all names... some are ideas or things, like flowers or trees. 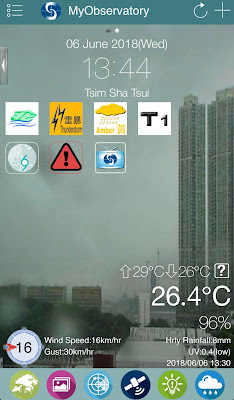 We have a great app called My Observatory that tracks the Hong Kong weather for us and sends us alerts for everything you can think of, including fire danger, cold warnings, heavy rain, and yes - typhoons. The alerts at this exact moment are many... The first line with the green symbols and arrow, with the blue waves below is a special announcement for flooding. We got three inches of rain in an hour, and its causing flash flooding in certain parts of the New Territories (the area of Hong Kong attached to Mainland China). The yellow Thunderstorm warning is important, as there are many lightning strikes in Hong Kong, and when this warning is in place, swimming pools are closed and outdoor activities are cancelled. The Amber Rain warning is indicating that we are getting a certain amount of rapid rainfall, which in turn can cause flooding. The T1 is the Typhoon warning level. The second row starts with the storm tracking map (see the photo above for what that looks like when you click on it). The triangle with the exclamation point is any current warning, which right now was an alert to be on the lookout for flash flooding. And finally the TV is a link to any current news stories featuring the storm. It also gives helpful info like the current temperature, the forecast high and low temps, the wind speed and direction, and the relative humidity (currently at 96%). If you have the notifications turned on, it will send alerts when anything changes. But you know what else this means? It's the start of the season when Lucy Rocket is perpetually terrified. 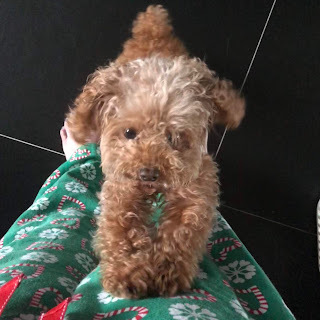 While fireworks and firecrackers do not concern her at all, thunder makes her whimper and cry, running all over the house, panting and shaking. Two nights ago we had thunder and lightning all night long, from midnight until 7:30 a.m. She woke everyone in the house up to share in her great discomfort. Michael and I took shifts sleeping and caring for her, and I shockingly had the very first morning of 2018 where I slept in past 7:00 a.m. because I was so completely exhausted. It's like having a newborn baby all over again. But a very mobile one who will not be calmed until the thunder stops. This is her this afternoon, trying to climb inside of me while giant booming thunder crashes around us. Yeah, I'm wearing Christmas jammies in June at 2:00 p.m. I work from home which makes this quite the perk! Hilariously, when I finally took my shower a bit later, she clawed at the shower door until I let her in. And then she stood there, attached to my ankles, water and shampoo and soap cascading down on her (sorry, no pic of that). This is a dog who absolutely hates baths and water (she is unaware that Poodles are a water breed, that their very name means Puddle...), so that gives you an idea of how much the thunder frightens her. Oooh boy, it's gonna be a long summer with this precious scaredy cat of a dog! Hope wherever you are today is dry and warm, not blazing hot and humid. Unless that's your thing... and if it is, may I cordially invite you to Hong Kong for the summer? Maybe you can dog sit while we go somewhere cooler?